Miami Trace sophomore Hunter McBee (25) zeros in on Circleville quarterback Will Tolbert (15) during the season-opening game at Miami Trace High School Friday, Aug. 24, 2018. McBee got the sack on this play. The Miami Trace Panthers waited some 10 months to get back onto the football field after going 1-9 in 2017. 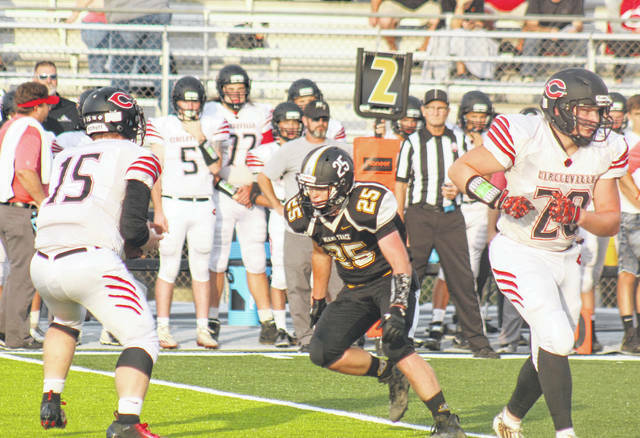 The new season affords everyone the opportunity to start anew and the Panthers took advantage of that chance with a season-opening 30-15 win over the visiting Tigers of Circleville High School Friday night. “Our inexperience showed early on,” Miami Trace head coach Jerry Williams said. “It really did. Then they settled in and got comfortable. Once they gained that momentum, they were fine. “I definitely think we were better-conditioned,” Williams said. “We got after it. I can’t say enough about Caden Sweitzer and how hard he ran the ball tonight. He was certainly our workhorse. The going was slow for both teams in a scoreless first quarter. In spite of three turnovers by the Panthers, including two interceptions by Circleville’s Ahlijah Wright, the Panthers were able to move the ball down the field late in the first half and score the first points on the new turf field with a 9-yard touchdown pass from Tyler Taylor to Dalton Mayer. Justin Shoemaker’s kick gave the Panthers a 7-0 lead at the half. The Tigers scored on their first possession of the third quarter, a 42-yard run by Cade Burnton. Max Lattimer’s kick tied the game with 10:18 to play in the period. The Panthers answered on their next possession as a couple of nice, long plays set up a 5-yard run by Caden Sweitzer. The extra-point kick went wide to the left, leaving the Panthers with a 13-7 lead with 6:56 to play in the third. After a very long punt by Circleville that rolled perhaps some 30 yards after hitting the ground, the Tigers were able to sack the Panthers’ quarterback in the end zone for a safety, making it a 13-9 game with 4:40 to play in the third quarter. The Panthers’ defense forced another Circleville punt and Miami Trace soon hit pay dirt again, with a 22-yard pass from Taylor to Mayer. Shoemaker’s kick made it 20-9 with 1:41 to play in the third. Austin Conklin recovered a Circleville fumble for the Panthers with 13.9 seconds to play in the third. With 9:42 to play in the game, Shoemaker booted a 33-yard field goal for Miami Trace, pushing the score to 23-9. Circleville had another lost fumble, this one recovered by Javin Robinette. That set up Miami Trace’s final score of the night, an 8-yard pass from Taylor to Robinette. Shoemaker’s kick gave the Panthers a 30-9 lead with 5:42 to play. Circleville’s Will Tolbert scored on a 4-yard run with 26.2 seconds to play in the game. The Tigers’ two-point conversion pass was no good. As the stadium clock counted down to zero, a couple of Panther players drenched head coach Jerry Williams with a bucket of ice water. There was another facet to the night, a very serious situation involving Miami Trace School senior Coby Seyfang, who was involved in an accident Thursday evening. Both teams, as well as the Miami Trace student section and members of the crowd gathered on the field for a prayer led by Pastor Bruce Morrison, praying for the recovery of young Mr. Seyfang. The Panthers will be on the road next week to take on Wilmington. Wilmington opened the season with a 50-26 loss to Valley View. Circleville will return to Fayette County next week to take on the Washington Blue Lions. Washington defeated Blanchester in a high-scoring game Friday, 58-42.